BIRMINGHAM, AL (KTRK) — Alabama police are investigating a Chinese restaurant owner who allegedly opened fire on a customer after she complained about a cockroach in her egg roll. 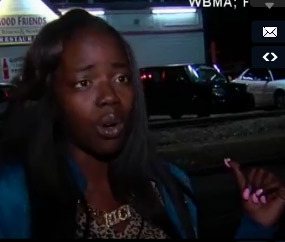 Jatari Walker tells WBMA-TV in Birmingham, Alabama, that she went into the Good Friends Chinese and seafood restaurant and bought dinner. But on the way home, she says she discovered unwelcome ingredient in her egg roll. “I bit into my egg roll and I discovered there was a roach inside,” Walker said. Walker says she turned around and headed back to the restaurant to show the manager and get a refund. But she told WBMA-TV things didn’t play out as she expected. Then as Walker she turned to leave, police say the restaurant’s owner, Chun Ching, allegedly took out a gun and fired a shot. Fortunately, Walker wasn’t struck by the bullet. “What if the bullet wouldn’t have went in the wall and it woulda hit me and I wouldn’t have been able to go home to my child?” Walker said. Police arrested Ching and he’s now behind bars. Workers at the restaurant didn’t want to talk to us about what happened. “I’m still shocked. It’s still in my mind. I could’ve been gone,” Walker said.